Title: : Africae pars meridional. Description: Attractive miniature map of Southern Africa. Decorative ship flying the Dutch flag celebrates the Dutch expansion into Southern Africa at this time. Coloured. Description: Decorative Dutch Golden Age map of Southern Africa, with a charming cartouche and animals. This is one of the most iconic seventeenth-century maps of the region. Original hand-colour. Description: Southern Africa, an attractive map showing mountains and rivers, with the empire of Monomotapa covering most of the interior. Coloured. Description: Early map speculating about the source of the Nile being from an underground lake in the Mountains of the Moon. Description: Coloured copper engraved map of Southern Africa embellished with ships. Description: Miniature map of Southern Africa representing the territory of Mutapa, a Shona kingdom that originated in the first half of the 15th century. Coloured. Description: Miniature coloured map of Southern Africa divided into mythical kingdoms. Description: Stunning globe gore centring on Madagascar and the coast of Mozambique. Slight worming. Description: An early map of South Africa that postulates on the tribes, settlements and geographical features in the continents interior. European discoveries are noted around the coast. 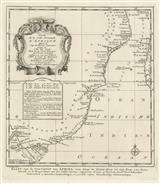 Description: Cape Town and Table Bay feature on the Churchill Edition of this intriguing map. A dotted line marks, ‘where they have intended to cut through the ground’, potentially a canal to quicken the trade route around the Cape. Description: South part of Africa. Coloured. 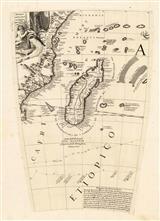 Description: Striking engraving of the Cape of Good Hope noting early Dutch settlements. Description: Important map of Southern Africa denoting new geography based on De L'Isle but published in Amsterdam. Original colour. Description: South Western Coast of Africa from Angola and south towards Namibia and South Africa to the Cape of Good Hope. Dutch text. Description: South Eastern Coast of Africa from Mozambique to South Africa and the Cape of Good Hope. Dutch text.